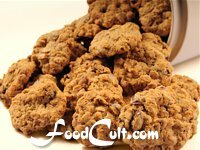 Cookies - Free, Easy Recipes @ FoodCult.com - A Place for Galganov's Recipes and More - Food Matters! A good cookie is decadence personified. They are true junk food but ... like any other sweet treat they can be a little less "junky". Some will always be junk food but our favourites are crammed with such miracle foods as oatmeal or flax (two of our favourite baking ingredients) ... or may contain some whole wheat flour ... and are always made, in this house, with organic, unbleached flour and organic sugar. When molasses is, additionally, called for; we use organic sugar with a reduced molasses volume. The reason we do this is because the organic cane sugar we use still contains some of its original molasses. Enjoy your cookies but remember, they are, typically, a treat - not health food.